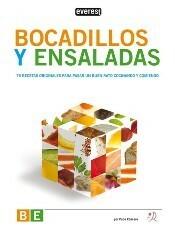 Everest has just published the latest book by Paco Roncero called Bocadillos and Salads, an interactive book that will entertain and amuse the reader through different gastronomic suggestions. This book, focusing on bocadillos -Spanish sandwiches- and salads, shows the complexity of their preparation, even though they might look easy to be prepared at a simple glance. Roncero has designed this book to be a practical handbook that includes a big variety of bread types -from the most common to the most surprising ones- and salads. As for bocadillos, its wide range of choices to combine ingredients and textures will allow the reader prepare his own bocadillos and sandwiches by simply choosing a bread variety and its filling. A suggestion on the appropriate drink is also made by Roncero. As for salads, this book gives the possibility of combining 25 types of lettuce or vegetables, 25 different dressings -oil, sauces and vinaigrette types-, as well as 25 toppings, so that a different salad can be daily elaborated. The design of this book is particularly innovative -each page is divided into 3 parts, so that ingredients can be combined in the most convenient way according to the reader's liking. Roncero´s aim is to give an approach of the bocadillo and salad world from an amusing perspective, based on the combination of ingredients and development of numerous gastronomic varieties. In short, it offers a database of bread, bocadillos, drinks and salads that will delight our imagination and, of course, our palate.